Canker sores are a common oral complaint, and these sores can occur in both children and younger adults. Canker sores are described as small, shallow ulcers in the mouth or on the tongues. Although they often make talking and eating uncomfortable, they do not cause serious damage. Generally, most of the canker sores can heal on their own within a few weeks. In this article, we want to show you some common causes and symptoms of canker sores. After that, we will show you some of the best ways on how to prevent canker sores from becoming worse. So, if you or other people around you are suffering from discomfort caused by these canker sores, you should keep both of your eyes on this interesting entire article right now. Although the exact causes of canker sores are unknown, there are some factors that can contribute to the development of canker sores. List of Top 48 Best Home Remedies For Stress Relief And Removal will show you some of the natural treatments that can help you relieve your stress, so check it out! If you are suffering from canker sores in the mouth, you can consider applying one or more of the following home remedies to prevent them from becoming worse. 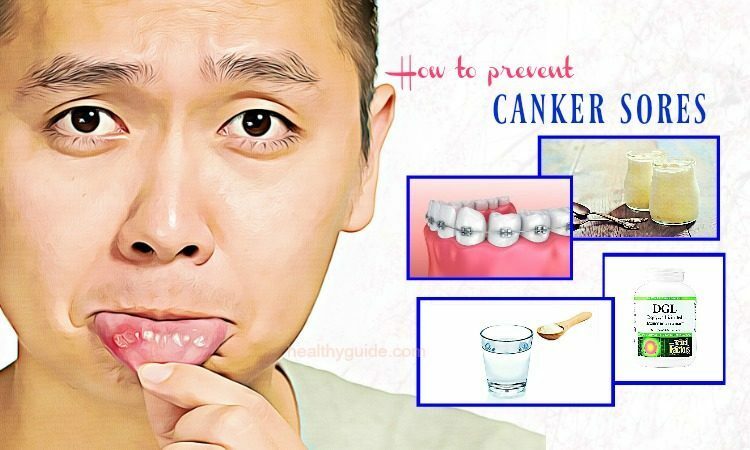 This is the first way on how to prevent canker sores on lip and tongue that we want to mention in this interesting article and want all of my readers to apply for good. You should follow a good oral hygiene to clean your teeth. Use a soft bristle toothbrush to brush the teeth twice per day and after having meal. This technique will help reduce the occurring of food particles and bacteria that can lead to the development of canker sores. Also, using a soft bristle toothbrush can also help in preventing irritation in the mouth. 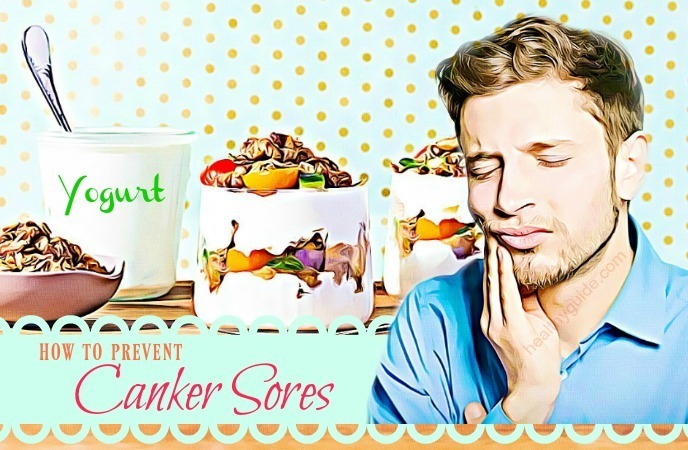 Read on 24 Tips On How To Get Rid Of Canker Sores Inside The Mouth to discover some of the natural treatments for canker sores that you can apply with ease at home. If you wear braces, you need to ensure that they are not rubbing or scratching your mouth’s inside. Using poorly- fitting dental equipment can cause canker sores to develop in the mouth. Consult your dentist if your dental equipment is irritating the mouth. If your braces are rubbing the mouth and cause sores, you can try using dental wax in order to cover sharp edges. Following a healthy diet can help improve your immune system, making it one of the best ways on how to prevent canker sores on lip, tongue in mouth that you should try to apply as soon as possible. actually, a healthy diet can help prevent canker sores from developing. Try to add a variety of fresh fruits and vegetables to your daily diet plan. When it comes to natural ways on how to prevent canker sores on lip, tongue, and in mouth, you should try to avoid using toothpaste that contains sodium lauryl sulfate. According to a study , sodium lauryl sulfate can be added to many commercial mouthwashes and toothpastes in order to help toothpaste thicken. However, this additive has been found to increase the risks of getting canker sores in the mouth. Therefore, when purchasing dental care products, you should read the labels on these products to ensure that they do not contain this additive. Eating some foods such as chips, nuts and pretzels can irritate the mouth. Also, you should avoid eating citrus foods such as limes and lemons, so your mouth will not get irritated. Besides, spicy foods, salty foods,and acidic foods such as oranges, pineapples, and grapefruits can also cause irritation in the mouth, resulting in the presence of canker sores. Addition to this, you should avoid sucking on chew gum or candies because they can irritate the mouth and boost the growth of canker sores. Finally, you should avoid foods that you are allergic to. This is because after consuming these foods, you can develop allergic reaction, canker sores and swelling in the mouth or throat. Alum powder can be used to pickle veggies and preserve foods. 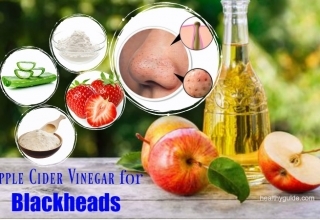 It contains astringent properties that can help you dry out canker sores. Therefore, using alum powder is considered as one of the best ways on how to prevent canker sores that you should give it a try! Apply this paste onto your canker sores. Repeat this remedy daily until your canker sores are improved. Chamomile tea is often used to boost relaxation, induce sleep, and support digestion. It can also help make painful spasms get relaxed in the digestive track. A compound called levomenol found in chamomile has been found to relieve inflammation. Besides, chamomile tea also contains antiseptic properties, which will help relieve the pain caused by canker sores and also boost up the healing process. Leave it on for 1 minute. Repeat this remedy twice a day in order to help relieve pain and discomfort and also boost up the healing process. According to a research about bacteria in food production , yogurt is produced by bacterial fermentation, which uses yeast or bacteria to turn carbohydrates into organic acids, resulting in a bacteria- rich substance. You may know that consuming yogurt can help maintain a healthy balance to gut flora, but consuming it daily may be one of the best ways on how to prevent canker sores. You just need to opt for yogurt that contains live cultures and then eat 1 tbsp. of yogurt 3 times per day. You can also add a little raw honey to your yogurt for taste. There are other effective ways on how to prevent canker sores on lip and tongue in this article. So, you should keep reading this interesting article and then try to apply one or more of these remedies for good. Sage tea has been used to help you get rid of mouth inflammation. It works as a great mouth rinse for a few oral problems. Sage contains antibacterial, antiseptic, anti-inflammatory, and astringent properties, so it can help relieve inflammation. You can buy sage mouthwash in your local pharmacies or you can make your homemade sage mouthwash. Strain it and allow the solution to cool down. After that, swish the mouthwash around your mouth for several minutes. Finally, spit the rinse out or swallow it. If you are looking for a great way on how to prevent canker sores on tongue, you can consider using cayenne “cream”. The fact is that cayenne contains capsaicin, which can make it one of the best ways on how to prevent canker sores from becoming worse. Mix ground cayenne pepper with enough warm water to create a thick paste. Then, apply this paste directly to your canker sores with the help of a cotton swab. 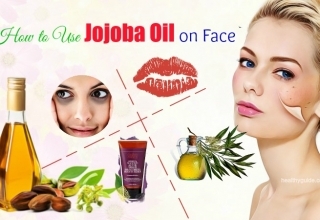 Reapply this remedy 2-3 times daily for the best results. Raw honey contains anti-bacterial and anti-inflammatory properties, so it can be used as a soothing coating for your painful canker sores. So, if you are looking for a simple way on how to prevent canker sores in mouth from becoming worse, honey is what you should not skip out. Then, apply a thick layer of raw honey to your sores. Repeat this remedy 2-3 times daily. Ideally, you should apply it before going to bed. Clove oil contains a substance called eugenol, which has been used to bring a relief to patients. Currently, clove oil is often used in the form of pure extracted, and it is also useful for oral pain from canker sores to toothache. Then, allow 4- 5 drops of clove oil to sink in. Mix this clove oil with ½ tsp. 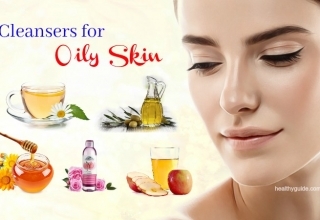 of olive oil and then use a cotton ball to apply it directly to your sores for about 5-8 minutes. Both of eucalyptus and peppermint essential oil contain anti-inflammatory and anti-microbial properties, which help reduce further discomfort caused by fluid buildup or swelling. Addition to this, the cooling properties found in both essential oils can also help in numbing the nerve endings in the mouth. Here is one of the recipes to make homemade numbing spray at home. Pour 2 tbsp. of grapeseed or olive oil into a glass mister bottle. Then, add 10 drops of essential peppermint oil and 8 drops of eucalyptus essential oil to the mister bottle. Shake it well, and then spray some onto your canker sores. You can find some numbing mouth gels at your local drugstore and use them for curing canker sores. They may be effective in numbing the pain and then you can eat or chew foods without irritation. Carefully follow the labels on your numbing gel and do not apply it too much. The numbing mouth gel should be safe for you to swallow. 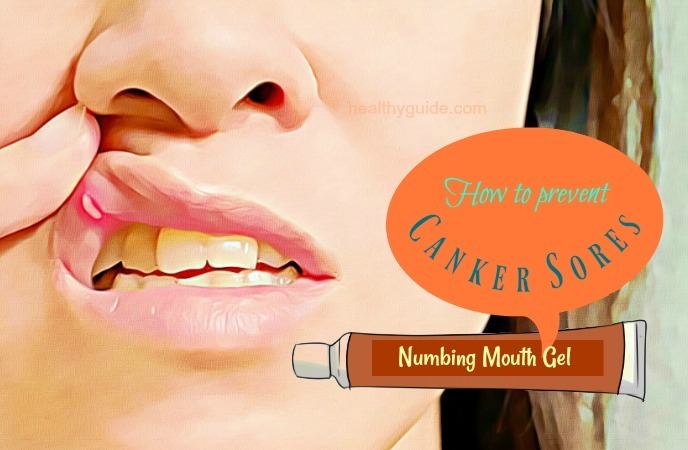 Actually, using numbing mouth gel is one of the best ways on how to prevent canker sores on tongue from becoming worse. So, if you are suffering from pain, inflammation and discomfort caused by canker sores, try out this gel right away! You should remember that high stress levels can cause the canker sores development. If your canker sores occur when you are stressed, the first thing you need to do is to calm down and relax yourself. When you start to be stressed, you should try doing some relaxing activities such as deep breathing exercises, yoga or focusing on your hobby. With anti-inflammatory and antimicrobial properties, coconut oil may be helpful when it comes to treating canker sores. Simply, you just need to use a cotton swab to applya thick layer of coconut oil onto your canker sores. Reapply this remedy a few times per day until your canker sores disappear. According to a research about aloe vera , aloe vera contains substances called salicylates, which help relieve pain and inflammation. Also, aloe vera gel is a powerful antibiotic. You can swish some the gel taken from an aloe vera leaf around the mouth, or apply the gel directly to your canker sores. You can also drink it as a supplement to boost up the process of healing. If you do not have any aloe vera leaf in the house, you can purchase aloe vera juice in the markets or at health food stores. When it comes to natural ways on how to prevent canker sores on tongue, you can consider using hydrogen peroxide. According to a study, hydrogen peroxide can help boost up the healing process by cleaning the canker sores and relieving bacteria in the mouth. Mix equal parts of a 3% solution of hydrogen peroxide with water. Then, soak a cotton ball into the mixture before applying it directly to your canker sores several times daily. Alternatively, you can use diluted hydrogen peroxide to swish around your mouth for about 60 seconds before spitting it out. Another way on how to prevent canker sores in mouth from becoming worse is to use tea bags. You can also place damp tea bags over your canker sores in order to help them heal the inflammation and pain. Simply, steep some herbal tea bags in water and then allow them to cool down. After that, you place them over your canker sores to boost the healing process. Apple cider vinegar can be used directly or mixed with lukewarm water to help cure canker sores. You can mix apple cider vinegar with ½ cup of lukewarm water. And then, swish it around in the mouth for about 30-60 seconds. For the best results, you should reapply it twice a day until your canker soresdisappear. Alternatively, you can hold a spoonful of apple cider vinegar in the mouth until you cannot stand it. Just note that apple cider vinegar can cause irritation in the mouth, so you should use it with caution. Also, it is important to rinse it off after applying this remedy to prevent tooth enamel. Most of the canker sores will disappear naturally; nonetheless, if you want to boost up the process of healing, you can try gargling your mouth with saltwater rinse. You just need to add 1 tbsp. of sea salt to 4 ounces of lukewarm water. And then, gargle with the saltwater rinse twice a day to heal the canker sores. Just remember that you should not swallow this mouth rinse. Swish it around in the mouth for about 10-15 seconds before spiting it out. Other great ways on how to prevent canker sores in mouth that you should try must include using baking soda. According to a research, baking soda is found to maintain pH balance and also reduce inflammation, which may help boost up the healing process. Although baking soda will not harm in case you swallow it, it is very salty; therefore, you should try to avoid swallowing it. Dissolve 1 tsp. of baking soda in a half cup of water. Swirl the baking soda rinse in the mouth for about 15 – 30 seconds before spitting it out. Reapply this remedy every few hours if required. Watermelon frost can be used to treat canker sores, though there is no scientific study to support it. You can find watermelon frost in the forms of powder, tablet, and spray. You just need to apply it directly to your canker sores for pain relief. However, watermelon frost has been reported to have high mercury levels, so you should be careful before purchasing it. 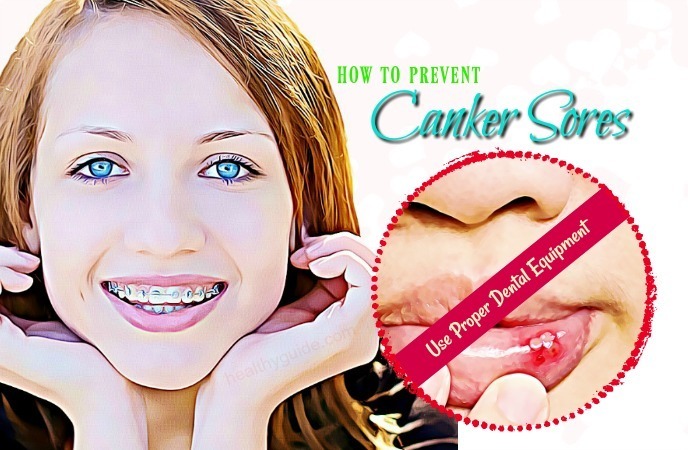 Do you want to know other great ways on how to prevent canker sores in mouth that you can apply with ease at home? Continue to read this entire article and then try to apply one or more of these home remedies as soon as possible. Echinacea has wound-healing powers, making it one of the best treatments for canker sores on tongue that you should try out! Mix 1 tsp. each of echinacea with warm water. Then, swish the solution around the mouth for 2 minutes before swallowing or spitting it out. Alternatively, you can also rinse off the mouth with echinacea tea. Repeat either remedy up to twice per day. Vitamin E has found to work best for canker sores. You just need to apply some vitamin E directly on your canker sores regularly until your sores heal. For canker sore treatments, the recommended dose of vitamin E is 30,000 IU. This is another great way on how to prevent canker sores in mouth that you should not look down, yet try applying for good. According to a study , milk of magnesia has high content of magnesium hydroxide. It can be used orally to change the pH in your mouth; therefore helping prevent irritation and reduce inflammation and pain. Apply some milk of magnesia to the sores in your mouth. Allow it to sit on for a few seconds before rinsing it off. Repeat this remedy up to 3 times per day. DGL mouth rinse is made from a licorice extract and has anti-inflammatory powers. DGL can be used as a mouth patch to help cure canker sores. Simply, apply the DGL patch to your sores and allow it to sit on for at least half an hour. DGL can be also found in the supplement form, so you can make use to make homemade mouth rinse. Mix the powder taking from one DGL capsule with a cup of lukewarm water. Then, swish the solution around the mouth for 3 minutes before spitting it out. L-lysine is known as an essential amino acid, which your body needs to stay healthy. This nutrient is found in protein- rich foods such as milk, nuts, eggs, red meat, cheese, sardines and beans. However, you should take lysine with caution to avoid causing side effects such as abdominal cramps, nausea, diarrhea as well as stomach pain. For treating canker sores, you can consider taking l-lysine supplements. If your immune system is not good, canker sores may occur. Actually, zinc is an essential mineral that can help boost up your immunity. If you take zinc lozenges regularly, your body can fight off bacteria causing canker sores and also boost the healing time. Currently, you can find zinc lozenges at pharmacies and online. Vitamin B12 has been found to be effective in preventing canker sores. A study suggested that those who regularly take enough vitamin B12 reported to decrease their risk of developing canker sores than those who do not. Similarly, vitamin B9 also has the ability to prevent the canker sores from becoming worse; therefore, you should also add healthy foods that are rich in vitamin B9 to your daily diet for good. Another way on how to prevent canker sores is that you should cut down your alcohol consumption. Actually, excessive alcohol will be able to deplete B vitamins including vitamin B9 and vitamin B12. Therefore, reducing the intake of alcohol has been found to prevent canker sores from becoming worse. This is the last but very important way on how to prevent canker sores in mouth from becoming worse that we want to mention in this article and want all of my readers suffering from these sores to eat more of the iron-rich foods. If you are deficient in iron, so your chances of developing canker sores will increase than those who take enough of this mineral. Therefore, if you want to prevent canker sores from becoming worse, you should try to add more iron-rich foods such as dried fruits, egg yolks, lean red meat, oysters, liver, tuna, salmon, whole grains and spinach to your daily diet. Canker sores get worse, even after applying home remedies. Canker sores are gone along with other symptoms, such as , fever, headache, or skin rash. Some home remedies for canker sores can help boost up the healing process, but they cannot cure canker sores overnight. 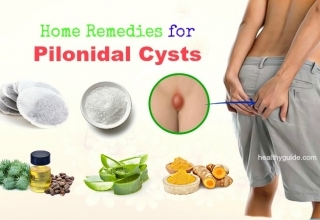 Besides, many of these home remedies are not well-studied, so you have to use them with caution. After reading this article, we hope that you and my other readers of Healthy Guide who are struggling with canker sores in their mouth. 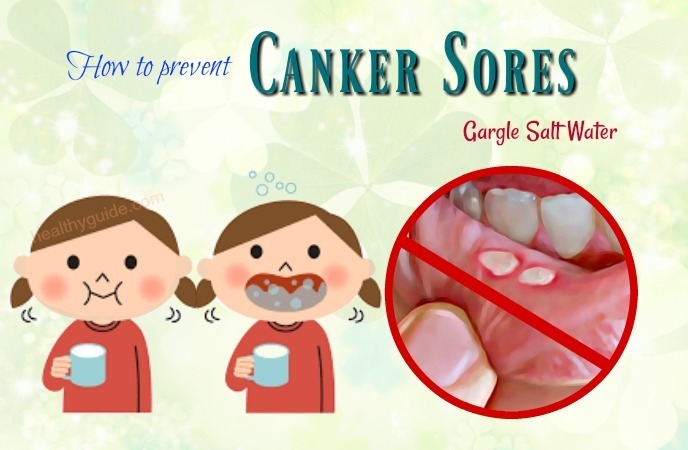 Also, if you know other effective ways on how to prevent canker sores, please to share them with other readers by leaving these natural treatments in the comment section below. Sexual Healthcare for Men – Top 7 Facts that You Should Check out!